These are the chocolate variety and taste great. You can keep them stored in a plastic container for 3-4 weeks they will always be available to pull out to eat as a snack or with a nice cup of hot tea on a cold Swedish night! Around the holidays I like to make big batches of these and they are perfect for giving as little gifts to dinner guests or when I am fortunate to asked to dinner. 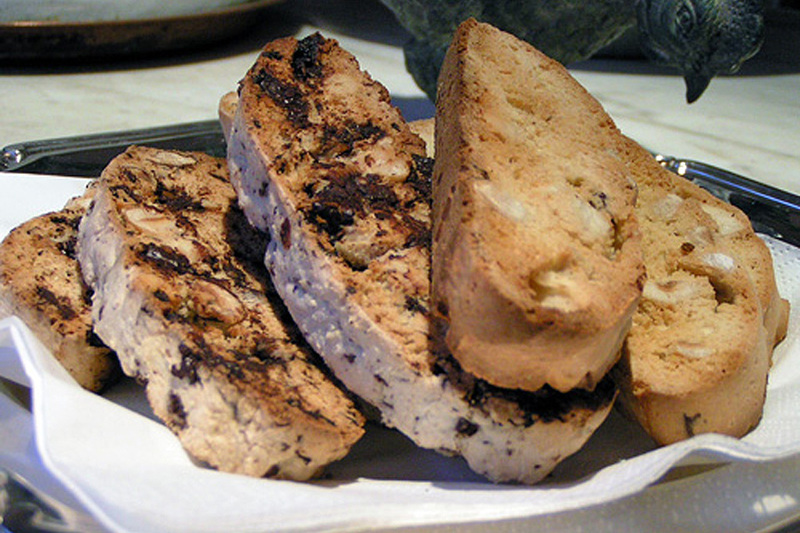 Whether or not you make chocolate biscotti or plain almond biscotti they are great to have on hand when company comes to visit or to give as gifts. 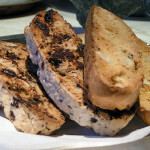 They cost a fraction of ready made biscotti, take little work and taste far superior. In a bowl large enough to take the eggs sugar and eventually the flour. With an electric hand held mixer beat the eggs and sugar untilit becomes light, pale in color and forms a ribbon. You should set the timer and beat this on high speed for 5 minutes. When the eggs and sugar are beaten add the vanilla extract. Sieve in the flour containing the baking powder and the salt and fold it into the egg and sugar mix. The batter will be pretty thick and sticky. Add the chopped nuts and chocolate and fold them in. Take a baking tray or cookie sheet with a sheet of parchment (baking paper) on it and with a rubber spatula scrape out the dough onto the baking sheet trying to form a log about 30 cm. or 1ft long. If the dough is too sticky - wet your hands – shake off the excess water and try shaping it with your fingers. I find this always messy but wetting my hands does help. Remove from the oven and move to a cooling rack and let sit for only 10 minutes. With a serrated knife cut the log into slices about 1½ cm. or ¾ of an inch thick. Place on the baking try lined with a clean piece of parchment (baking paper) and bake for a further 5 minutes remove pan turn all the slices over and bake again for another 5 minutes. The goal is to dry out the biscotti and lightly color them without burning the chocolate. You should get about 16 slices from each log. When making these with chocolate you should keep in mind that the oven should be heated to 180°C or 350°F. I cooked these at 200°C or 400°F and burnt the bottom of it and to add insult to injury the chocolate tasted scorched after I cut them and toasted the slices. So now I pay a little more attention and they come out just fine. You bake these twice. The second time is to dry them out, it is this that gives them their long shelf life and to give them a more appealing color. Be sure that on the second baking that they are dried and only lightly colored to avoid burning the chocolate. Chocolate does have a very low burning (scorching) point so using an oven thermometer can be handy. These taste great and because you can keep them stored in a plastic container for 3-4 weeks they will always be available to pull out to eat with a nice cup of hot tea on a cold Swedish night! They are also dead easy to make. If you are making them as gifts, I suggest that you don’t make more than two recipes at a time because of the dough’s sticky nature but 2 recipes together should give you enough biscotti to make 4 gift packs. If you would like to make these without the chocolate just leave it out and add 1 ½ msk or 1 ½ tbls. of Amaretto liquor or 1 tsk or 1 teas. good quality almond extract. This will really give them a truly authentic flavor. Personally I think the Amaretto is too much in the chocolate biscotti.